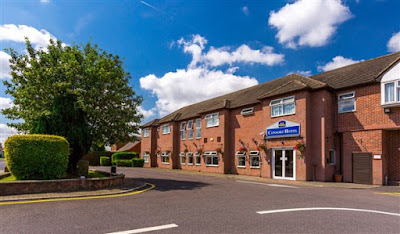 The Best Western Consort Hotel in Thurcroft, Rotherham has recently been acquired for an undisclosed sum by James Edward Hotels Ltd, operated by its subsidiary Company Montgomery Hotels Ltd. The 27-room hotel was put up for sale in January 2012 with an asking price of £1.3m. It was purchased later in the year by the hotels division of investment company, West Register Property, from the Peat family who had owned the hotel since 1997. The new owners said that they are pleased to have acquired the hotel to join its existing hotel property portfolio and are committed to remaining within the Best Western partnership, together with a plan for continued investment in the hotel. Sharon Leahy, general manager at the hotel, said; "The existing management and staff are looking forward to an exciting future at the hotel as the team aims to maintain and continue to improve our high standards and the guest experience. "All exisisting bookings, deposit payments and contracts in place will not be affected by the recent change of ownership." Best Western GB is part of the American group, Best Western International. It started in the UK in 1967 with Interchange Hotels, who joined with Consort Hotels in 1999, to start the British arm of the Best Western brand. There are over 270 Best Western hotels in the UK - all of which are independently owned and run. Previous owners, West Register Property, was the controversial acquisition and investment arm of the state-owned Royal Bank of Scotland. In 2014, the bank took the decision to wind down and sell any assets in West Register due to the "damaging perception that the bank had a conflict of interest when it purchased a property as part of a restructuring process." This is the most appalling hotel in the whole of the UK. I went there last week for an Xmas dinner with my husband and his staff and it There was a lack of staff, the menu had been changed without notifying us, the place was cold, the waiter and waitress were on their first day and their uniforms were appalling. We had ordered our food four weeks earlier but the manager had no knowledge of this. The manager and the catering manager were argumentative and rude. The food was absolutely the worst you could ever have. Badly boiled veg and my cod was presented to me after just being boiled and smelling terrible. Will never go there again and never recommend to anyone. Appalling food and service, been visiting every christmas with 55 members all pensioners. Food service at 1pm finish at 5pm with cold coffee,cold food, not enough veg which was all over boiled tasteless. Staff leaving walking out and crying. I am so embarrassed, last year was bad but we were told all had been corrected and gave them the benefit of the doubt what a wrong decision. We will never return and what a shame this used to be such an enjoyable time for all our ladies. Some were ill afterwards I wonder why. Owners, get involved, you are losing money and custom. No empathy was shown at the time we reported, nothing. Won't give higher management names.